What’s the difference between a car and a truck? While car/truck “crossovers” are all the rage today, the distinction between passenger cars and light trucks has always been hazy and arbitrary. Cargo-carrying wagons, of course, precede the development of the automobile by many centuries; since most early cars were little more than self-propelled wagons with a driver’s seat and a few rudimentary controls, the only major difference between a car and a truck was whether it had seats or a cargo bed. Consequently, a great many automakers offered trucks in the years prior to the first world war, including some names you might not expect, like Oldsmobile, Buick, and Packard. More precisely, these automakers offered commercial chassis, on which enterprising buyers could install a cargo box, station wagon body, or other addenda. Except for their lack of bodywork, early commercial chassis differed very little from their passenger-car brethren. They might have stiffer springs and perhaps a reinforced frame, but they were otherwise largely indistinguishable from cars. Even if a manufacturer did not offer a commercial version of their cars, it was not a great challenge to remove the rear section of a roadster and install a cargo box in its place, as a fair number of Model T Ford buyers did. By 1917, some manufacturers had begun to offer bigger heavy-duty chassis, like Ford’s Model TT or Chevrolet’s cheekily named Model T one-ton truck, but there was still a market for light-duty, car-based trucks. By the mid-twenties, manufacturers were offering factory-built truck bodies for such vehicles. Ford introduced its first factory-built Model T Runabout with Pick-Up Body in 1925. Chevrolet, which had introduced its first commercial chassis in 1918, followed suit a year later, although until 1930, Chevy truck bodies were still made by outside suppliers, principally Indiana’s Martin-Parry Company. These early light trucks, the ancestors of the modern crossover, were essentially standard roadsters or coupes with a small, add-on cargo box in place of a trunk or rumble seat. Other than a slightly stiffer ride, they were no more or less livable than a contemporary car. Many farmers or small shopkeepers used them as their only vehicles, in part because it was often easier to obtain a bank loan to buy a truck than a car. Ford’s first utility was the 1928 Roadster Utility Vehicle. Like its American cousins, it was a light-duty roadster pickup, built on the locally assembled Model A chassis. 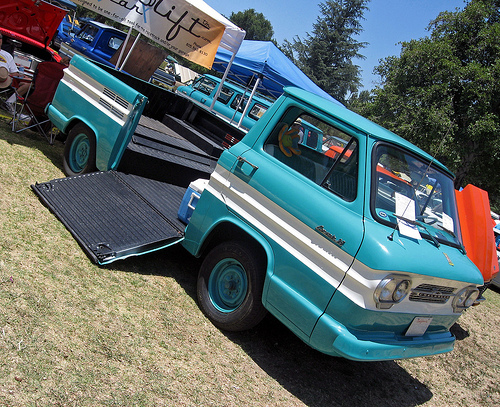 Unlike most American trucks, however, its flush-sided cargo bed was integral with the cab. This approach was not suited to really heavy loads, which tended to twist the sheet metal at the leading edge of the bed (as Chevrolet discovered when it considered a similar design for its 1955 Cameo pickup), but it offered a wider, longer bed, without the extra expense and running costs of a bigger truck. The early ute was very popular with Australian farmers and ranchers, although those who used it as their sole form of transportation soon became annoyed with its limited weather protection. In the U.S., Ford had introduced a closed-cab version of the Model A truck, complete with roll-up windows, but Ford Australia had not followed suit, perhaps assuming it would be too expensive for the local market. According to legend, in 1932, the wife of a local farmer wrote a letter to the Ford factory in Geelong, Victoria, challenging the company to build a vehicle that was equally suited to going to church or carrying goods to market. This letter, we are told, came to the attention of managing director Hubert French and sales manager Scott Ingliss, who decided the lady had a point. 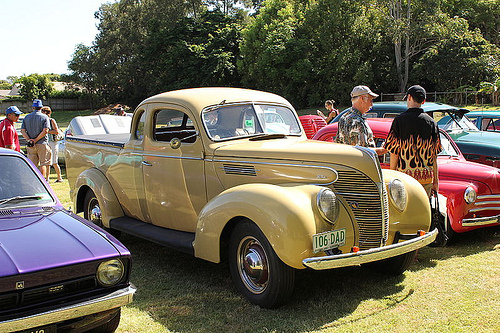 They subsequently developed a closed-cab version of the ute, which Ford introduced in 1934 as the Ford Coupe Utility 302. We’re not entirely sure we buy the letter story, which has the flavor of a press-office concoction. The need for closed-cab pickups was becoming readily apparent by 1932 anyway. In the U.S., Chevrolet dropped its roadster pickups in 1932, while Ford’s American operation abandoned them in 1934, just as the Coupe Utility went on sale. Ford Australia kept the Roadster Utility in production for a few more years, but the writing was on the wall, and it vanished after 1938. The Coupe Utility and its eventual imitators became staples of the Australian market, but for some reason, Ford did not offer an equivalent in North America. Henry Ford was certainly aware of the ute, which he supposedly dubbed “Kangaroo Chaser,” but the closest Ford came to an integral-bed coupe utility in the States was a limited run of about 300 flush-sided Model A Deluxe pickups built for a General Electric promotion in 1931. By the mid-thirties, American light trucks were becoming less and less like their passenger-car contemporaries. Some commercial vehicles, like station wagons and sedan deliveries, still shared passenger-car chassis and some sheet metal, but the pickups were becoming more truck-like. They still bore a stylistic resemblance to their automotive cousins, but as automobiles became more refined and more luxurious, the trucks remained Spartan. They also eschewed some of the technological developments of contemporary cars, particularly independent front suspension. Chevrolet first offered “Knee Action” front suspension on its 1934 cars, but Chevy and GMC trucks retained the simpler, cheaper beam axle until the early sixties. The main reason for this conservatism was cost. In the midst of the Depression, the main selling point for trucks was maximum utility at minimum expense; they were working vehicles, not toys. Studebaker and Hudson discovered this lesson the hard way. 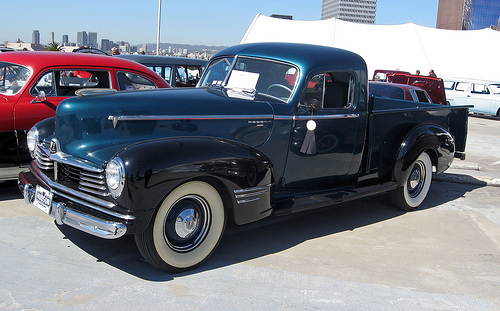 Studebaker launched its stylish Coupe-Express in 1937, while Hudson followed with its “Big Boy” Cab Pickups in 1939. Like the coupe pickups of a few years earlier, both were essentially passenger cars up to the B-pillars, with pickup beds instead of trunks. With independent suspension and car-like interiors, they were much more pleasant to drive than most light trucks of the era, but they cost far more than a plain work truck, and their sales were poor. Most truck buyers could not afford such frills, and customers whose budgets could stretch that far were not generally buying trucks. The idea of a truck as a lifestyle accessory was still years away. Studebaker abandoned the Coupe Express after 1939; Hudson continued the Cab Pickup after the war, but sales remained minuscule, and it was dropped in 1947. The front end of this 1946 Hudson pickup is basically a Commodore Eight, sharing the sedan’s 254 cu. in. (4,170 cc) straight eight and dashboard. With independent suspension, it rides better than any contemporary pickup, but it’s a genuine three-quarter-ton hauler. Sales were limited: only 3,104 in 1946. Note that unlike the Australian ute, the pickup bed is not integral with the cab. As the economy improved after the war, American pickup trucks became increasingly style conscious, but still not particularly refined. There was once again room for a plusher, more comfortable car-based pickup. The resurgence of the coupe pickup/ute concept in the U.S. was driven by the ascendancy of another sort of commercial vehicle: the station wagon. Before the war, wood-bodied station wagons were very rare, and normally purchased only by commercial buyers. Although they’re prized by surfers and collectors today, woodies creaked and rattled incessantly, they were prone to rot, and they required onerous regular maintenance. The station wagon did not really take off as a passenger vehicle until the arrival of the steel-bodied station wagon after the war. Ford was the last major automaker to abandon the woody, but once it finally did, Dearborn rolled out a comprehensive array of steel-bodied wagons in two- and four-door form, with or without wood exterior trim. Ford even considered a two-door coupe pickup variation, but the regular wagons were a higher priority, and the pickup idea was shelved for several more years. The idea eventually caught the fancy of Robert McNamara, who became the Ford Division general manager in 1955. McNamara was fond of clever product concepts, especially if they could be produced relatively cheaply. The coupe pickup became part of the 1957 Ford line, developed in the Ford passenger-car studio by Bob Maguire, Dave Ash, Chuck Mashigan, and A.J. Middlestead. It was subsequently dubbed Ranchero. Structurally, the first Ford Ranchero was a two-door Ranch Wagon with a shortened roof and a metal bedliner bolted over the wagon’s floorpan, using the lower half of the wagon’s tailgate. It shared the Ranch Wagon’s stiffer rear springs, giving it a nominal payload of 1,200 lb (544 kg). It wasn’t ideal for serious hauling, particularly since the Ranchero was not exactly over-endowed with brake or tire capacity, but it was adequate for light-duty use. More significantly, the driving experience was little different from that of the two-door wagon; compared to the contemporary Ford F-100 pickup, it was practically a Cadillac. 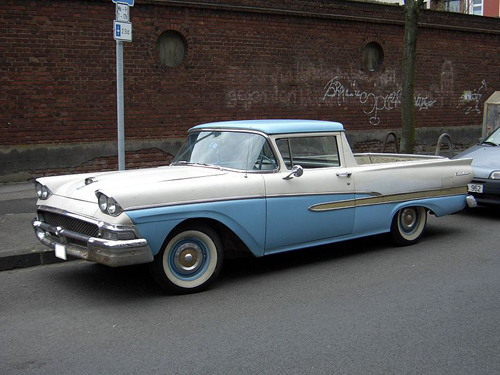 The Ford Ranchero debuted in December 1956, about two months after the rest of the 1957 Fords. Despite its obvious passenger-car origins, the Ranchero was marketed as part of the truck line and sold through Ford Truck dealers. Ford advertising trumpeted it as “an entirely new kind of vehicle,” which was rather silly considering that the company’s own Australian subsidiary had offered the same sort of thing for more than 20 years, but it had the feeling of blinding obviousness that often characterizes strong new product ideas. The Ranchero attracted a great deal of attention, not least from Chevrolet, which hastened to develop its own version. Strictly from the standpoint of sales volume, Chevrolet needn’t have bothered. Although it undoubtedly generated a fair amount of showroom traffic, the public attention the Ford Ranchero earned didn’t translate into huge sales. The main obstacle was price. While the Ranchero was not extravagantly expensive by car standards — it was actually about $250 cheaper than a Ranch Wagon — it cost nearly 20% more than an F-100 and its load capacity was strictly for the country club set. Its first-year sales were similar to Ford’s other impractical niche cars, the Thunderbird and the Skyliner: 21,706. Its limited audience was quickly sated, and the 1958 model was hit hard by the recession; sales plunged to 9,950 in 1958. The ’59s sold a little better, 14,169, but that was still small potatoes compared to the 54,251 two-door wagons and more than 150,000 F-100 pickups Ford sold that year. Still, the tooling costs for the Ranchero were so low that Ford didn’t lose any money on it. Rather than dropping it for 1960, Ford — again, probably, at the behest of McNamara — moved the Ranchero to the new compact Falcon platform. 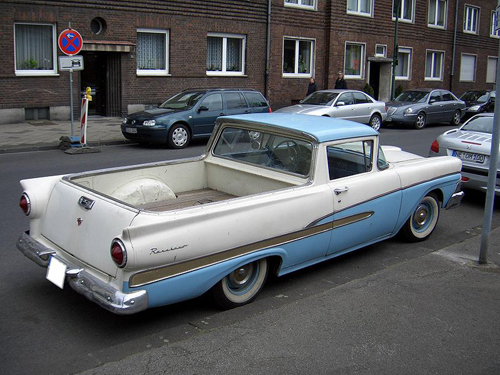 The 1960 Ford Ranchero was 19 inches (48 cm) shorter than its predecessor, and with Falcon’s anemic 144 cu. in. (2,365 cc) engine, it was even less suitable for serious hauling. The point of the exercise, however, was sharply reducing the price. The 1960 Ranchero was more than $400 cheaper than the ’59 and now cost less than any of Ford’s big trucks. Sales improved to just over 21,000 and remained steady into the mid-sixties. Ironically, Chevrolet stylists had considered a new coupe pickup well before the Ford Ranchero appeared; according to stylist Chuck Jordan, Harley Earl himself had suggested such a thing back in 1952. As was often becoming the case, though, it took Ford’s example to convince Chevrolet to move, and Chevy’s response to the Ranchero did not appear until 1959, just as Ford was preparing to shift gears. Like its Ford rival, Chevrolet’s coupe pickup was based on a two-door wagon, the low-line Brookwood, with some trim borrowed from the Bel Air hardtop. Also like the early Ford Ranchero, the Chevrolet ute’s price split the difference between Chevy trucks and two-door wagons. It even had a Spanish name: Chevrolet El Camino, borrowed from a 1954 Cadillac show car. Where the El Camino differed most from the Ranchero was in suspension. While the Ranchero had station wagon springs for a higher load capacity, the El Camino used the same standard suspension as Chevrolet passenger cars, giving it a basic load capacity of only 650 lb (295 kg). The El Camino’s interior was also poverty-spec, whereas most Rancheros had plush “Custom” trim. Then there was the matter of styling. As we have discussed, GM went a little berserk in 1959 in a desperate effort to reclaim styling leadership from Chrysler. The 1959 Chevrolets were among the wildest of the bunch, with bizarre “eyebrow” front-end styling and gullwing tail fins. There are still those who will insist the El Camino is the least outré of the 1959 Chevrolet line, but it was a polarizing design by any standard. Customizers loved the early El Camino and it’s easy to see why; all it takes is a lurid paint job and the obligatory belly-scraping lowering to make it look like a Kalifornia Kustom. With its delirious styling and limited load capacity, the Chevrolet El Camino was arguably America’s first purely image-driven pickup. Trucks like the 1955-58 Chevy Cameo with its fiberglass faux-fleetside cargo box or the Dodge Sweptside trucks with their finny station-wagon fenders, had put a big emphasis on style, but they were still working vehicles. In standard form, the El Camino was even less useful as a truck than the Ranchero was. You could make it into a reasonable light-duty hauler with heavy-duty suspension and other options, but one got the distinct impression that that was not the point. It seemed aimed at the sort of buyer who aspired to a Corvette, but needed to carry a couple of surfboards. 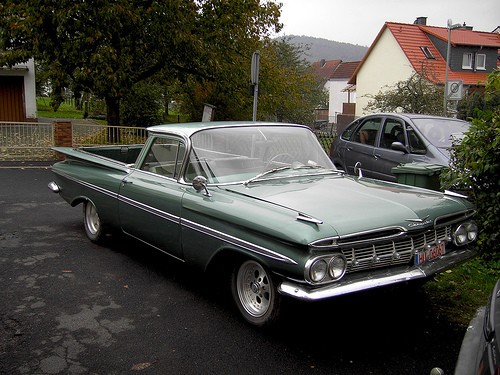 Unsurprisingly, the El Camino’s early sales were modest: 22,246 in 1959, 14,163 of the more restrained 1960 version. After that, Chevrolet gave up — at least temporarily. 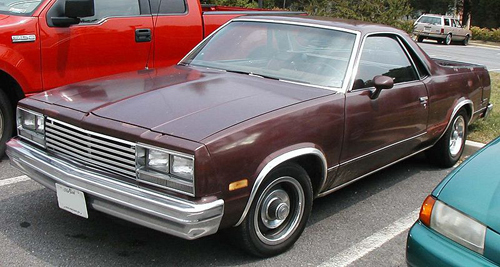 Despite the modest sales, the Chevrolet El Camino had its fans. As soon as it was discontinued, demand for used examples became quite strong. Some dealers began lobbying Chevrolet Truck general sales manager James Conlon to bring it back. With the appearance of the downsized Ford Ranchero, Chevrolet considered basing the El Camino on the Chevy II station wagon, then in preparation for a 1962 introduction. However, early experiments were not promising; the Chevy II’s semi-unitized structure did not easily lend itself to pickup use. Chevrolet no longer offered a two-door wagon in the full-size line — the last was dropped at the end of the 1960 model year — which complicated the prospect of a new full-size El Camino. After much gnashing of teeth, Chevrolet management decided that their best bet was to use the upcoming A-body intermediate platform. The logic was straightforward: The A-body would be usefully bigger than the Falcon-based Ford Ranchero; it would have V8 availability; and its body-on-frame construction would be better suited for truck duty. The A-body wasn’t slated to debut until 1964, however, so in the meantime, dealers had to console themselves with the Loadside and Rampside of the “Forward Control” Corvair truck. Chevrolet’s FC 95 Corvair-based vans (FC for “Forward Control,” 95 for the 95-inch (2,413mm) wheelbase) sold in decent numbers, but buyers reacted coolly to the rear-engined, air-cooled Loadside and Rampside trucks. The latter’s clever side ramp made it popular with some commercial customers, particularly the phone company, which bought quite a few of them for cable installers. Predictably, the new Chevrolet El Camino was based on the two-door Chevelle wagon, sharing the wagon’s perimeter frame, powertrains, suspension, and much of its sheet metal. The major variation on the now-familiar coupe-utility formula was the provision of standard Air Lift rear shocks, which could be inflated to compensate for heavy loads. The load rating of a V8 El Camino was now 1,100 lb (500 kg), although more than about 700 lb (318 kg) would exceed the capacity of its standard tires. It was, therefore, at least as useful as the original Ford Ranchero (admittedly not saying much) despite its smaller dimensions. 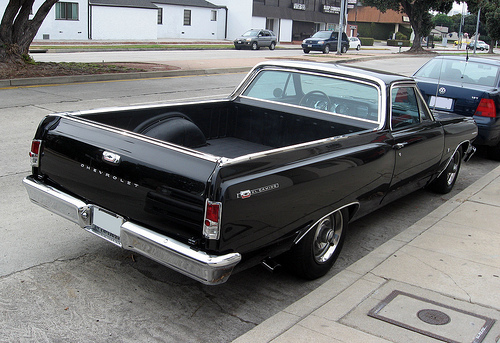 The 1964 Chevrolet El Camino was 198.9 inches (5,052mm) long on a 115-in (2,921mm) wheelbase and with the 283 cu. in. (4,638 cc) V8 and Powerglide weighed about 3,200 lb (1,450 kg). It was exactly 5 inches (127 mm) longer than other Chevelles. As you would expect, the El Camino drove much like a Chevelle, which meant slow but easy steering, a soft ride, underachieving brakes, and an occasionally disconcerting lack of structural rigidity. The El Camino’s air shocks quelled some of the standard A-body’s tendency to bottom its rear suspension, so it didn’t handle badly by the dubious standards of its era. On the other hand, its pronounced forward weight bias could create problems of its own, including a penchant for alarming tail-happiness in panic stops. Like any Chevelle, the El Camino’s straight-line performance depended which engine you bought. The basic 194 cu. in. (3,184 cc) six with Powerglide required about 15 seconds to go from 0-60 mph (0-97 km/h) with an absolute top speed of perhaps 90 mph (145 km/h). With the 283 cu. in. (4,638 cc) or 327 cu. in. (5,354 cc) V8s, it had brisk performance. This 1964 Chevrolet El Camino has Powerglide, although three- and four-speed manuals were also available. With the 283-4V engine, it could do 0-60 mph (0-97 km/h) in around nine seconds and reach a top speed of 110 mph (177 km/h). A few El Caminos may have had the L76 327 (5,354 cc) engine from the Corvette with 365 gross horsepower (272 kW), although it was very rare. Chevrolet sold 32,548 El Caminos in 1964, beating the compact Ranchero by a sizable margin and topping the combined four-year production of the Corvair Rampside and Loadside. This was still a trivial quantity by Chevrolet standards — the division sold around 2.8 million cars and trucks that year — but the El Camino’s hand-me-down tooling ensured that it was profitable. Sales hovered around 35,000 through 1967. The market had clearly changed considerably since the days of the original Ranchero and El Camino. The U.S. economy was doing well, the Baby Boomers were reaching driving age, and specialty cars like the Ford Mustang were all the rage. While buyers of the late fifties had balked at the prices of the Ranchero and El Camino, nearly two-thirds of all A-body El Caminos were the pricier V8 Custom model — which was, incidentally, about the same price as a V8 Mustang hardtop. The El Camino also outsold the wagon on which it was based, and did well enough to justify continuing it after the two-door wagon was dropped in 1966. Although it was exactly a foot (31 cm) shorter than the “full-size” 1960 El Camino, the 1964 Chevrolet El Camino’s bed was actually a bit longer than its predecessor. Tailgate is borrowed from the two-door Chevelle wagon. As a load hauler, the El Camino was obviously inferior to a conventional pickup truck, but, as with Australian utes, it was a useful compromise for customers intended to use it as their sole vehicle. Since the El Camino’s passenger capacity was limited unless someone rode in the bed (a practice illegal in many U.S. states), it wasn’t an ideal family vehicle — unsurprisingly, buyers tended to be younger men. However, it was certainly sexier than a station wagon and was civilized enough to not raise eyebrows in polite society, something that in those days wasn’t really true of pickup trucks except in rural areas. With the bigger engines, particularly the 396 cu. in. (6,488 cc) big block introduced in 1966, the El Camino also could do a passable imitation of a Supercar. While all that inarguably made the El Camino a niche-market vehicle, it was nonetheless a viable niche and sales gradually climbed. 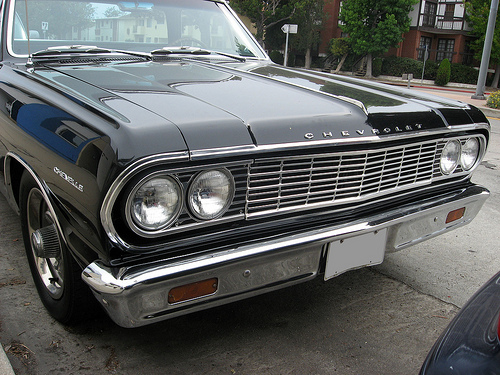 The El Camino was redesigned in 1968 along with the rest of the Chevelle line, getting sleeker new styling. (We are not fond of pickup trucks as a rule, but we’re of a mind that the 1968–1972 El Camino is better-looking than the contemporary Chevelle on which it was based.) It went over well with buyers; Chevrolet sold more than 41,000 El Caminos in 1968 and nearly 50,000 in 1969 and 1970. In 1971, the El Camino also got a GMC clone, initially called Sprint, which accounted for an additional 5,000-6,000 sales each year. The mounting popularity of the Chevrolet El Camino no doubt caused some consternation at Ford, where the Ranchero was languishing. The Falcon was slipping by the mid-sixties, cannibalized by the Mustang, and the Falcon Ranchero was stagnant, selling about half the volume of the El Camino. 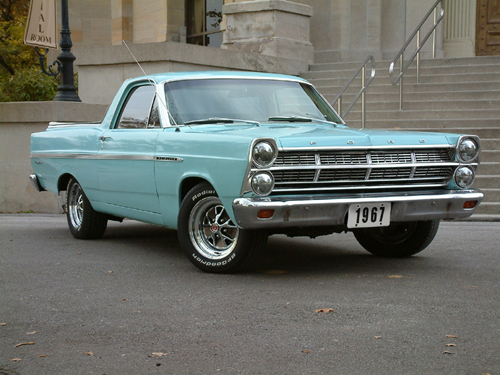 Ford didn’t help matters by transforming the Ranchero into a Falcon-Fairlane hybrid in 1966 and then switching it to the Fairlane platform the following year. The Fairlane-based Ranchero was once again directly competitive with the El Camino in size and performance, but buyers, perhaps confused by the platform shuffling, did not respond and sales remained static. Ranchero sales didn’t really take off until 1972, when it was redesigned again along with the Torino line. Its best year was 1973, with sales just under 46,000. Even then, that was 30% less than the El Camino. By the late sixties, the Ford Ranchero and Chevrolet El Camino faced a different sort of competition: compact pickup trucks from Nissan and Toyota. Unlike the utes, the Japanese minitrucks were essentially miniature versions of full-size trucks, powered by four-cylinder engines. They were far less comfortable than the car-based Americans, with a bouncy unladen ride and limited power, but they were more than 30% cheaper. Despite their comparatively tiny size — nearly three feet shorter than a Ranchero or El Camino — the minitrucks gave up only about 4 sq. ft. (0.4 m²) of bed space and were much more suited to rough use. Not only were they rugged little trucks, the owner of a $2,000 Toyota Hilux was unlikely to blink at jobs that would daunt the buyer who’d just spent close to $4,000 on an El Camino SS. Although their sales rivaled the combined total of the American utes, the Japanese trucks were not direct competitors for the El Camino and Ranchero. Nonetheless, they did serve to delineate the domestic coupe pickups’ place in the world. For buyers who wanted a compact, light-duty hauler, the Datsun and Toyota were a much better value. The El Camino and Ranchero were aimed at the dude ranch crowd: people who liked the look and the image, but who were more interested in comfort and convenience than serious work. The 1968-72 Chevrolet El Camino’s roofline recalls the “flying buttress” sail panels of GM’s 1966-67 A-body hardtops. Even your author, who finds the popularity of these vehicles deeply puzzling, must admit that the El Camino of this generation is sportier-looking than the contemporary Chevelle hardtop, whose semi-fastback lines look comparatively pudgy. At 206.8 inches (5,273mm) on a 116-inch (2,946mm) wheelbase, the 1971 El Camino was only about 3 inches (72 mm) shorter than its nominally full-size 1959-60 predecessors. You could order any engine up to 454 cu. in. (7,443 cc) and 425 gross horsepower (317 kW), although this one has the more ordinary 350 (5,733 cc) 2V with 245 gross hp (183 kW). 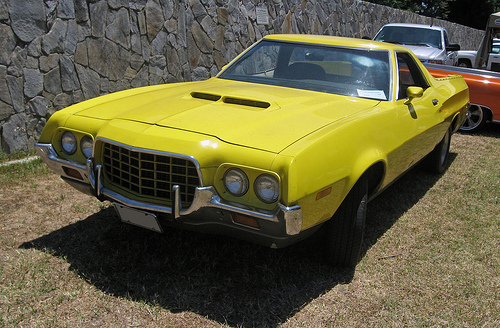 Fortunately for Chevrolet and Ford, the seventies provided a bull market for image cars. While rising insurance costs quickly destroyed the Supercar market, and the pony cars were fading away, Baby Boomers were still eager for something more distinctive than an ordinary sedan or wagon. Personal-luxury coupes like the Chevrolet Monte Carlo flourished, as did sporty-looking compacts like the downsized Mustang II. The Ford Ranchero was redesigned with the Torino line in 1972, reverting to body-on-frame construction. It was available in three series: 500, sporty GTs (like this one), and the Ranchero Squire, with faux wood side trim. Most Rancheros had a 302 cu. in. (4,942 cc) or 351 cu. in. (5,765 cc) engine, but the 429 (7,027 cc) was still available, now rated at 205 net horsepower (153 kW). For the same reasons, there was also a booming business in light trucks, vans, and sport-utility vehicles like the Ford Bronco, Chevrolet Blazer, and International Harvester Scout. As was increasingly the case with the Ranchero and El Camino, people bought trucks not for work, but because they liked the style, the same way a New Yorker might buy a pair of cowboy boots. What was the allure? The Baby Boom generation had grown up on TV Westerns and their mythology of cowboy individualism and pioneer spirit, myths that had a powerful emotional appeal, particularly in the malaise of the mid-seventies. A pickup truck or rugged sport-utility vehicle was a way for adults to play cowboy, to retreat from the pervasive disillusionment and pessimism of the national mood into comforting fantasy. There were a few buyers who really needed four-wheel drive or the ability to haul half a ton of hay, but they were fast becoming the minority. By the mid-seventies, the appeal of the Chevrolet El Camino and Ford Ranchero was being challenged by SUVs like the Ford Bronco. 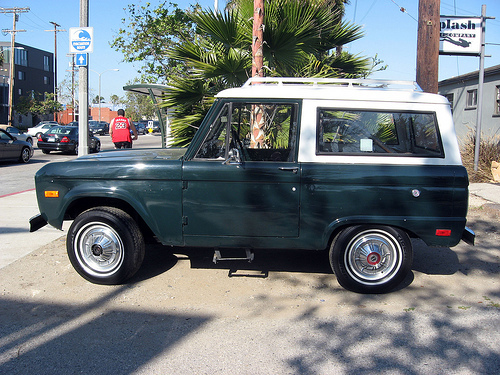 This is a 1976 Bronco, toward the end of the original, Falcon-derived generation. It’s powered by a 302 cu. in. (4,942 cc) V8 with 125 net horsepower (93 kW). Unsurprisingly, in that climate, the El Camino and Ranchero thrived. They still didn’t sell in huge numbers; even at their peak, their combined sales were well below the best years of the Mustang or the intermediate Supercars. They were barely a footnote on overall truck sales, which were climbing every year, and their sales would not have justified the development of a bespoke platform. As long as the investment cost remained low, however, they were quite profitable — the same logic that spurred the proliferation of truck-based SUVs 20 years later. The Ford Ranchero was the first of the pair to bow out, disappearing after 1979. In its final three years, it was eclipsed by Ford’s second-generation Bronco, a compact SUV based on a shortened F-100 pickup chassis. The Bronco was less useful as a load hauler than the Ranchero except perhaps for towing, but it had the notable advantages of a back seat and an enclosed trunk. It outsold the Ranchero by nearly three to one. 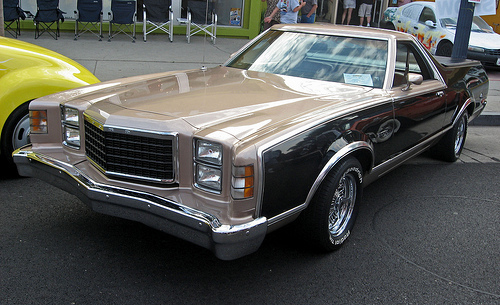 Ford was set to abandon the midsize LTD II (née Torino) platform at the end of the 1979 model year anyway and the volume of the Ranchero didn’t justify the cost of developing a new one based on the Fox platform or the new Panther full-size chassis. Sales of the final 1978-1979 Ford Ranchero weren’t terrible compared to previous years — about 23,000 in 1978, just over 25,000 in 1979 — but they were far less than the more-profitable Bronco, which sold more than 70,000 in ’78 and close to 76,000 in 1979. None of these figures were a patch on sales of the big F-series pickups, which accounted for around a million units a year in this era. As in 1959, just as Ford abandoned the concept, several other manufacturers jumped into the fray with coupe-pickups of their own, such as the Subaru BRAT, the Dodge Rampage/Plymouth Scamp, and the Volkswagen Caddy (known in the States as Rabbit Pickup). All were smaller than the Ranchero or El Camino, most were front-wheel drive, and none lasted very long in the U.S., although a few, like the Caddy, remained in production elsewhere in the world. 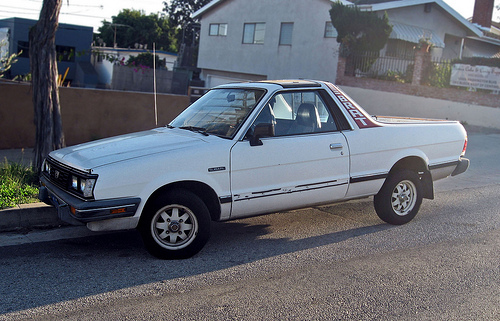 The Subaru BRAT (“Bi-drive Recreational All-terrain Transporter”) was an all-wheel-drive ute based on the Subaru Leone, produced from 1978 to 1993. It was sold in the U.S. through 1987. This is a 1986 Turbo, with a 94 hp (70 kW) turbocharged 1,781 cc (113 cu. in.) four. 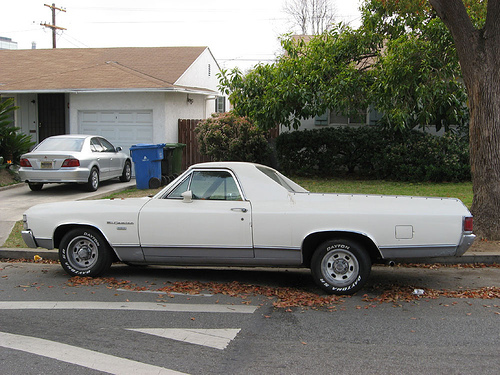 The Chevrolet El Camino and its GMC Sprint twin were downsized along with the rest of GM’s A-body cars in 1978, becoming a foot (31 cm) shorter overall, although their wheelbase was actually an inch (25 mm) longer than before. The Sprint was also renamed GMC Caballero. Sales of the lighter, trimmer version remained good, bolstered by a variety of rather gaudy trim packages. Aside from whatever profits the El Camino and Caballero earned, they now had an additional benefit: Since they were based on cars, they got better fuel economy than trucks and SUVs, which bolstered Chevrolet and GMC’s truck CAFE numbers. Like its cousin, the Chevrolet Monte Carlo, the El Camino earned a reprieve through the 1988 model year, six years after the A-bodies switched to front-wheel drive. Nevertheless, sales tapered off quickly, falling below 25,000 units a year in 1982 and never really recovering. Production ended in 1987, although a few hundred leftovers were sold as 1988 models. 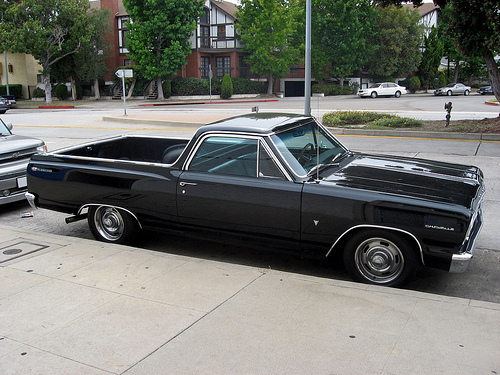 The main reason the El Camino and Ranchero died without a direct replacement was the proliferation of compact trucks. Detroit finally got into the compact pickup market in the mid-seventies by the simple expedient of rebadging Japanese minitrucks. By the early eighties, they had compact trucks of their own, like the small Ford Ranger and Chevy S-10. The new compact trucks now had conveniences like power steering and air conditioning, making them reasonably practical daily drivers. Moreover, they were cheaper to build and cheaper to buy than the car-based trucks and their four-cylinder engines boosted CAFE more than the six- and eight-cylinder Rancheros and El Caminos could. The old car-pickups simply became superfluous. The American public’s taste for trucks never abated, although by the nineties, the focus shifted to SUVs, which combined cowboy dress-up with greater passenger capacity and all-weather utility. By the turn of the century, this produced a new breed of car-SUV crossovers, ranging from the Toyota RAV4 to the BMW X5. The trend has yet to run its course. The Volkswagen Caddy, known in the U.S. as Rabbit Pickup, was a straightforward derivative of the Mk 1 Golf, making it one of the few front-wheel-drive utes. It was offered in the States only briefly (from 1980 to 1982), but still survives in other markets. We don’t think the American market lose its fascination with trucks any time soon; they simply have too much mythology and psychological baggage to easily disappear. As crossovers proliferate, however, the distinction between cars and trucks will become even more hazy — which, in some ways, it always was. 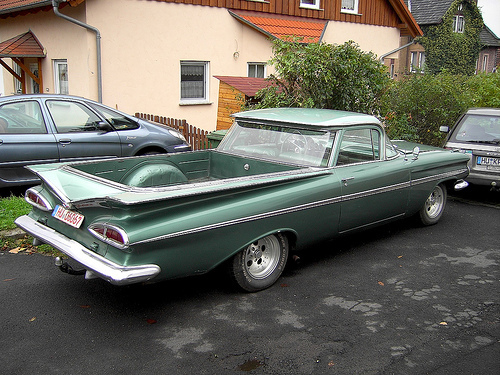 I’ve heard that rumor about the 1960 full sized Ranchero for years… but I’ve never seen any hard evidence that it’s true. A few years back someone had one on eBay that they claimed was one of them, but a check of the VIN revealed that it was made from a Ranch Wagon that had been built near the end of the 1960 model year and had originally been sold on the east coast, and the seller – when the vehicle was relisted after not selling the first time around – indicated that he had been “misled” about its past history. What is the source of your information? I’m also a bit surprised that you didn’t mention the 1957/58 Meteor Ranchero offered by Ford in Canada; like the much later GMC Caballero, the Meteor was simply a rebadged Ford with slightly different trim, offered for two years only. I owned a 1965 Falcon Ranchero until earlier this year; it was a tremendous little “cruck”, with its optional 200 cu. in. straight 6 and a three-on-the-tree, deluxe trim and also the optional two-tone package. But the time had come for it to be restored again, so I rather reluctantly let it go to someone with the skills and the youth to do the work. I hadn’t realized that the 1960 Ranchero story was a matter of dispute; I heard about it from an online discussion group, where someone quoted a book I don’t recall (perhaps one of Mike Mueller’s books on pickups, which doesn’t say anything one way or the other about its veracity). I have no authoritative evidence one way or the other, although it sounded plausible to me. In that pre-regulatory era, it was not at all uncommon for automakers to whip up small quantities of some unusual variation on their regular products for a specific customer, as long as they had the right connections and a big enough checkbook. The most obvious examples are the cars the automakers built for various police agencies, but there were also many others, like the famous Chevy COPO muscle cars and the one-off four-door Grand Prix Pontiac built for some VIP in 1962. I included the note because I thought it made an interesting parallel with the Ranchero’s most direct U.S.-market antecedent, the 1931 Model A truck built in very small numbers (less than 200) as part of a special General Electric promotion. I’ve amended the text to indicate the unconfirmed nature of the rumor. I actually didn’t know Ford sold a Meteor Ranchero in Canada, but I’m not always up on Canadian-only models. It makes sense, though. Are you sure Chevy made a full sized 2 door wagon until 1964? I’ve never seen one newer than 1960. Oops, that was an error. Looking again at the records, it looks like the last two-door Brookwood died at the end of the 1960 model year. I’ve edited the text accordingly. Thanks! Nice article – good overall review of these vehicles. I have a ’65 Falcon Ranchero. I would suggest that a mention about the Durango models be included though, just to show there were attempts by outside vendors to continue the Ranchero concept during the early Farimont years. "In its final three years, it was eclipsed by Ford’s new Bronco II, a compact SUV based on a shortened F-100 pickup chassis." Is this the second generation Bronco? The only one I’ve ever heard being referred to as Bronco II is the Ranger based one made starting 1984. Yes, you’re right — I incorrectly described the second-generation Bronco as Bronco II. I’m not up on the details of the Bronco, although I knew it had been redesigned for MY1978. Near my business in central Winnipeg MB, there is a 1958 Edsel version of the Ranchero. It appears to be a Ranchero version of the Edsel Roundup wagon, but it doesn’t look like a conversion – it looks like a factory original. I have yet to encounter the owner, but I’m dying to find out exactly what it is. I’ve been unable to find any sources on the internet that reference and Edsel Ranchero; so if anybody have information, please share! I’ve never heard of any plans to offer an Edsel (or Mercury) version of the Ranchero; since the Ford version was not a high-volume product, even if it were contemplated, it probably wouldn’t have gotten very far. However, the short-wheelbase ’58 Edsel (including the two-door Roundup) shared the body shell of the ’58 Ford. 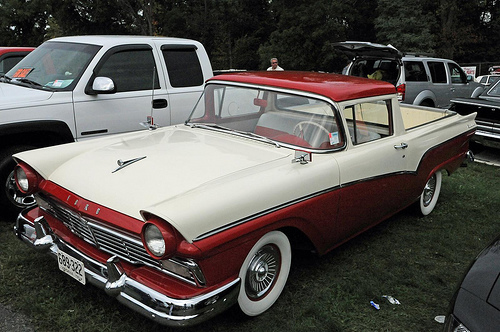 So, I imagine that attaching an Edsel wagon front clip to a ’58 Ranchero and installing Edsel trim would not be terribly difficult — probably not cheap, but I suppose neither is a frame-off restoration. It’s conceivable (although hard to verify without a lot of investigation) that it was some kind of factory one-off, created for a company exec or influential dealer. Such things happened periodically, particularly before the advent of safety and emissions certifications; for instance, I recall that there was a single four-door ’62 Pontiac Grand Prix, built for some VIP. It’s also possible it was a period custom done by some Edsel dealer as a promotional device — it would certainly have been an attention-getter. However, lacking any other information, the most likely possibility is just that somebody really wanted an Edsel Ranchero and had the money and patience to put it together in a professional-looking way. It sound sound like a real conversation piece. As the owner of a ’91 Toyota 1/4 ton [they claim 1/2 ton, but like any of the off-shore mini trucks, they used a smaller unit than the legitimate lb., much like current Asian clothing manufacturers use a smaller inch, so their products are always undersize,] I can sympathize with your observation about a market that seems overripe for a return of the small pickup. Toyota’s current “compact” pickup, the 3rd gen Tacoma, is gigantic [and their full size p.u. even larger than Detroit’s offerings, which are similarly Brobdingnagian.] What I find incomprehensible is that nobody offers a compact pickup w/ a diesel engine, & hasn’t since Isuzu stopped bringing them stateside 20 years ago. What’s up w/ that? Several of the majors offer them ALL OVER THE WORLD, but refuse to bring them to the U.S. market. Yes, diesels [except for Mercedes] got hit w/ a bad rap in the U.S. market after the brief craze following the fall of Iran, but those early 80’s diesels were ridiculous NA stationary engines hurriedly thrown on a chassis: modern turbo diesels offer radically different characteristics, w/ decent acceleration and superior performance to the petrol-engine models when laden. Yet if you want a diesel engine truck in the U.S., your only options are monster trucks suited to hauling a 20 ton cattle trailer, w/ price tags to match. The utter ridiculousness of the situation astounds me. As Paul Niedermeyer over at Curbside Classic has observed, a big sticking point when it comes to compact trucks is the demand for rear seating. Even for professional users like contractors, there’s something to be said for the ability to carry several of your guys and their tools at the same time, which is a tall order for a compact truck. Applying a four-door, two-row cab to a short-wheelbase compact truck platforms gives you something approximating the last Subaru Baja, and we saw how well that did on the market. In terms of diesels, aside from lingering consumer resistance, there are a couple of dilemmas. First, diesel fuel isn’t cheaper here — at some points, it’s actually more expensive than gasoline. Admittedly, when you factor in the better fuel economy, it’s still a better deal in terms of fuel cost per mile, but diesel also isn’t easily found in some areas. On top of that, the equipment required to get a turbodiesel engine to pass U.S. emissions standards tends to impose a substantial upfront premium that isn’t easy to recoup at U.S. fuel prices. As a result, turbodiesels here end up being limited to the gigantic heavy-duty versions, and even there I have to wonder how many of them are bought not for their capabilities but because they add to the junior big rig aura that a lot of full-size pickups seem to cultivate. Unless the U.S. dramatically increases fuel taxes or states start basing registration fees on CO2 emissions rather than just value — either of which would probably be seen as political suicide — there just doesn’t seem to be a big incentive to go diesel unless you’re really looking to haul a boat. 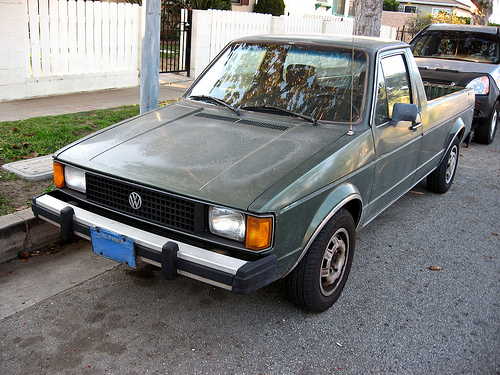 Actually, the Volkswagen Caddy pickup was known in the U.S. simply as the Volkswagen Rabbit Pickup. The “Sportruck” package was a special edition. Not all Rabbit pickups were of the “sportruck” package. Also, they were available in the United States from 1980 to 1984 from Volkswagen of America and were built in the USA. They were produced in South Africa for the rest of the world until 2009. Oops, I realize I had previously fixed that in the photo caption, but not in the main text. Thanks! At least in my case, I can give you the reason for the El Camino’s appeal, I’ve owned three of them. I was a diehard ’60s/’70s muscle car fan in my younger days and usually had a couple or three at a time. With an El Camino Super Sport I could have a muscle car and some utility at the same time. Plus almost all the repair parts were common with the Chevelles with the whole universe of Chevelle hot rodding parts applicable, too. I had two big block 396 powered El Caminos and a lesser 350 powered one. I sold the 350 one along with a 454 engine to a friend of mine. He said that with the 454 installed he could regularly surprise sports car owners at the stop lights. 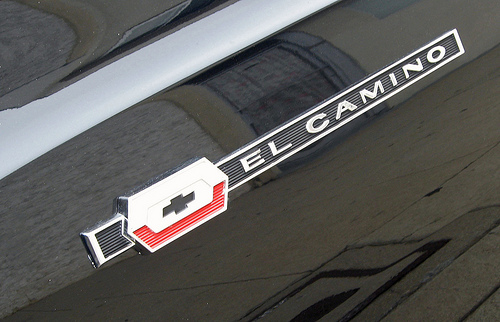 How did the insurance rates work out on the big-block El Caminos, if you recall? Ouch, 1970-’71 MY Ranchero not even mentioned. The first year of the shift to Torino body style, the year the Torino was Motor Trend Car of the Year, hideaway headlights, 429 options including the CobraJet…if you haven’t seen that one, you’ve missed the boat on the Ranchero in my book. Sales be damned. Great article, no offense, but you skipped straight from the underpowered, undersized Falcon Ranchero to the fish mouth as if those two years didn’t even happen, and I feel that overlooks the brief but spectacular high water mark for the Ranchero. I own a ’70 Ranchero GT with a 429 and love it so I had to chime in. I just wish it had a body on a frame instead of unit body so it could put those horses to better use in the towing department, and easier to find parts would be nice, but those are my only complaints. It’s got all the makings of a tear-down-a house pulling machine otherwise, or a nasty street rod with some weight thrown over the rear axle depending on how it’s tuned. It’s like a mullet – business in the front and a party in the back. Bought it in Phoenix from a retired rodeo cowboy when I was there on business and drove it back to Austin, TX one weekend after some brake work, gaskets and rubber part replacements with a good buddy who’s no longer with us. Wish we had flushed the gas tank before hitting the road. Lots of 40-year old sludge filled up a dozen or so fuel filters along the route making for a slow haul through the desert. Where is the Rampage ? A fair point — the Dodge Rampage would certainly qualify. I’m afraid I can’t help with finding parts — sorry!